Complete maternity information in one single platform. Euroking Connect provides clinicians and care providers with one single platform for accessing maternity information from a variety of otherwise separate sources. By creating an integrated view of all records related to a mother and baby, Euroking Connect helps digitise information, enhance clinical workflows and improve care received during pregnancy and after birth. EuroKing Connect will work with all maternity department IT systems, and implements all regional and national workflows. This ensures information relating to a mother and baby can be accessed from a single system. 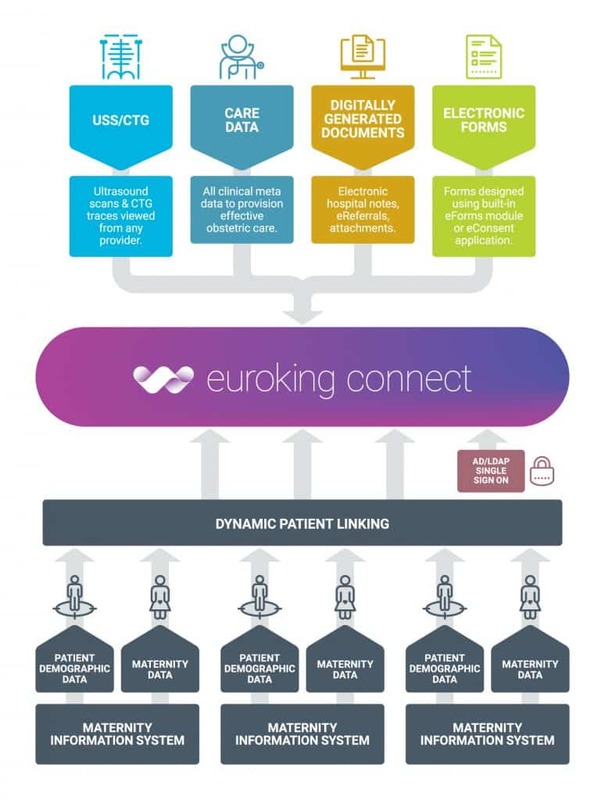 Using open standards and proven integration gateways, Euroking Connect brings together all forms of information related to a pregnancy and birth, including information gathered by local care providers, helping maternity departments adopt entirely digital processes and move towards paperless working. Euroking Connect negates the need to spend vital funds replacing local systems by delivering a cost-effective way of integrating existing medical records. We’re clinical department workflow specialists, applying expertise to simplify things and maximise end patient benefits and outcomes. We’re the leading provider of maternity information systems to the NHS and have over 30 years’ experience of developing MIS workflows that support clinicians and improve maternity care. We’re continually investing in improving the efficiency and effectiveness of our MIS and software by drawing on the unrivalled healthcare technology experience, development resources, and clinical expertise we have at Wellbeing Software. Euroking Connect enables organisations to bring together records relating to a pregnancy and birth from wide geographical areas, local care providers and multiple systems.